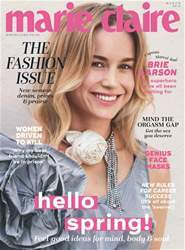 (4 Customer Reviews) | Write Review 12 issues per year Marie Claire is the must-have glossy fashion and features monthly magazine that inspires women to 'Think Smart and Look Amazing'. With a compelling mix of thought-provoking features and stylish, glamorous and wearable fashion and beauty, Marie Claire is an iconic worldwide brand that talks to women who know that a sharp mind is the perfect accessory. Every issue is packed with features ranging from amazing photojournalism and first-person true stories to investigations and humorous columnists, combined with inspirational fashion and beauty shoots, practical pages on trends and how to wear them – and lots and lots of shopping. Looking for Marie Claire in print? Unfortunately pocketmags.com does not sell print copies of Marie Claire, but all is not lost. Our partner at magazine.co.uk sells print subscriptions at the best prices online. Marie Claire is the must-have glossy fashion and features monthly magazine that inspires women to 'Think Smart and Look Amazing'. With a compelling mix of thought-provoking features and stylish, glamorous and wearable fashion and beauty, Marie Claire is an iconic worldwide brand that talks to women who know that a sharp mind is the perfect accessory. Every issue is packed with features ranging from amazing photojournalism and first-person true stories to investigations and humorous columnists, combined with inspirational fashion and beauty shoots, practical pages on trends and how to wear them – and lots and lots of shopping. You'll receive 12 issues during a 1 year Marie Claire magazine subscription. I find Marie Claire is an interesting read and it keeps me up to date with fashion and upcoming styles. You'll receive 12 issues during a 1 year Marie Claire magazine print subscription.